Started in 1806, completed in 1821. Cathedral and Mulberry Streets. 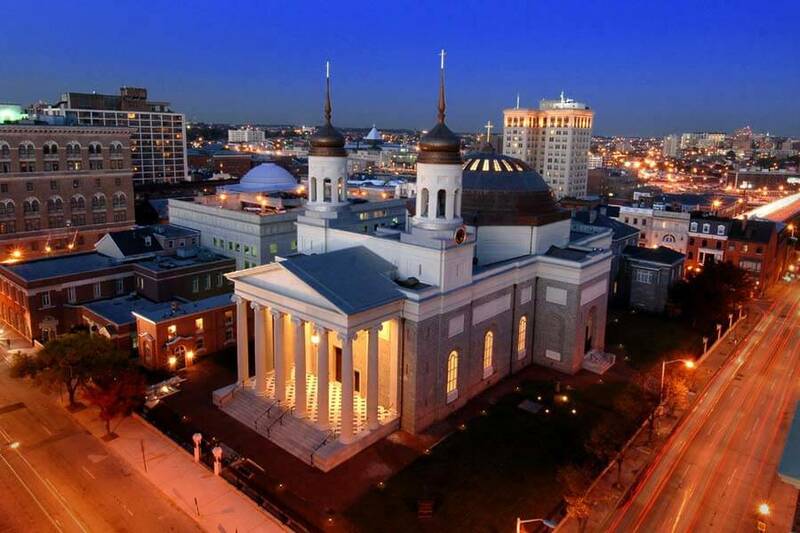 The Mother Church of Roman Catholicism in the United States, the Basilica of the National Shrine of the Assumption of the Virgin Mary is the first Metropolitan Cathedral in the United States. Cornerstone blessed by Bishop John Carroll in 1806; dedicated by Archbishop Ambrose Marechal in 1821. Designed by Benjamin Henry Latrobe (architect of the U.S. Capitol), the Basilica is considered one of the finest examples of new-classical architecture in the world. View the videos, America’s Basilica and the Basilica Slideshow Video. Adjoining the Basilica, 408 N. Charles Street, Baltimore, 21201. The Rosary is prayed Monday through Friday beginning at 7:00am, and on Saturday at 5:00pm. The Basilica is open from 8:00am-10:00am on Memorial Day, Independence Day, Labor Day, and Thanksgiving Day. There is one Mass at 9:00am, and no tours are offered on these days. In the event that Independence Day falls on a Sunday, the normal Sunday Mass schedule will apply. The Basilica of the Assumption Historic Trust, Inc.
A non-profit corporation, whose purpose is “to maintain, preserve, protect, repair and restore the structure and site of the Basilica, together with its grounds and ancillary buildings to ensure that their historic and landmark character shall be preserved in trust for the enrichment of future generations of Baltimoreans.” Chairman – Michael J. Ruck, Sr.
Bob Brown ,Director of Development. The Gift Shop is open most Weekends. Please call the Parish Office (410) 727-356 prior to your visit to inquire about the Gift Shop.